The Purple Mountain Observatory (PMO) is located in Nanjing, Jiangsu, is a directly affiliated institute under the Chinese Academy of Sciences (CAS). The predecessor of PMO is Institute of Astronomy, a division of National Academia Sinica, which was established in February 1928. Founded in May 1950, PMO is the first modern astronomical institute in China, also known as "the Cradle of Modern Astronomy in China". 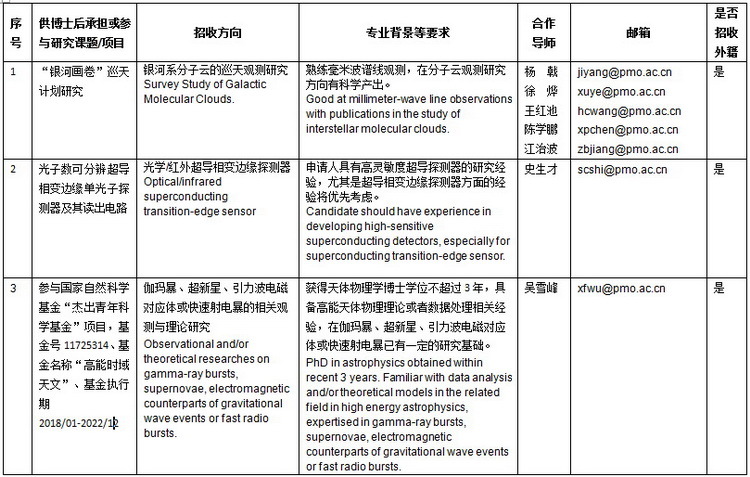 During the period of the 13th 5-year program, PMO aims to make impactful breakthroughs in the following four directions, namely, a) the dark matter particle detection satellite, b) the construction of the Chinese south-pole observatory, c) the space debris monitoring and research system, and d) the construction of the space-based Advanced Solar Observatory (ASO-S). 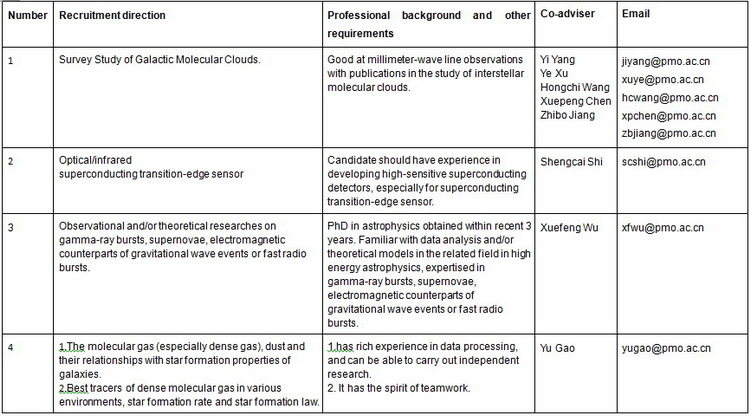 We also emphasize the graduate research training programs on the following five fields, namely, a) high-energy astrophysics, solar physics, and space-based astronomical technology, b) star formation in the universe and terahertz technology, c) orbital dynamics and detection methods of artificial celestial bodies, d) planet science, astronomical ephemerides, and deep-space exploration, and e) observational cosmology and galaxy formation. The center for Post-Doctoral Studies of astronomy at PMO are now recruiting post-doctors from both domestic and abroad in 2018. There are two types of post-doctoral researching positions, i.e., "general post-doctor” and “Chang Yu-Che Fellow”. 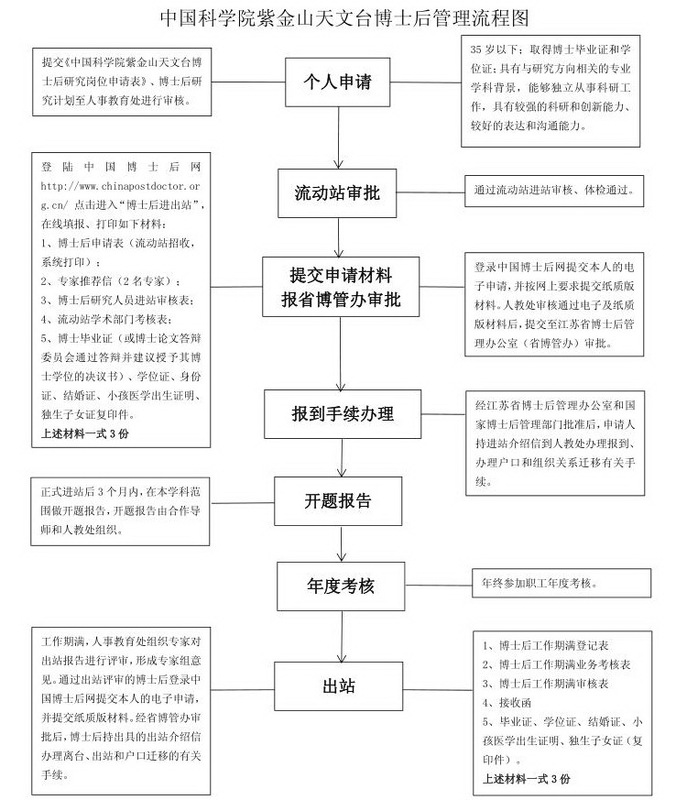 The "Chang Yu-Che Fellow ” program purpose to induce and train up senior post doctors, the remuneration of which will be in agreement with currently guidelines of 180,000-200,000 RMB per year (before tax), and the fellows will be selected preferentially when applying tenure job at PMO. Young talents who would like to dedicate themselves into astronomy as a career are cordially welcome. B) Being excellent in both character and learning, being good health and having good team spirit. 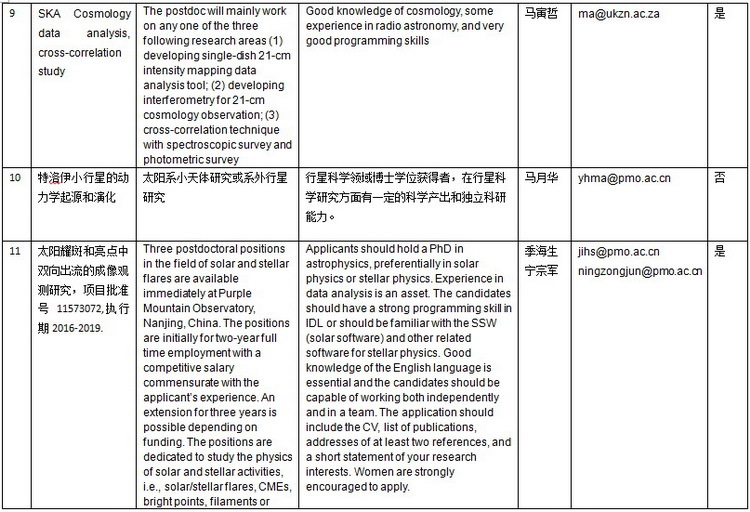 c) Having a background in the related application area, having the capacity to conduct independent research, having stronger abilities of science research and innovation, and excellent oral communication skills are also essential. D) National Post-Doctor Regulatory Commission has opened up a certain proportion for “the same discipline and the same research station” applicants and part-time post-doctor applicants, PhD graduates from PMO who would like to stay for a post-doctor research shall contact the Human Resources and Education Office of PMO. A) During the post-doctor period, the salary and benefits are carried out in accordance with the relevant state policies and PMO’s regulations of post-doctor positions. B) Postdoctoral researchers are, in principle, required to be full-time, with a period of 2 years. 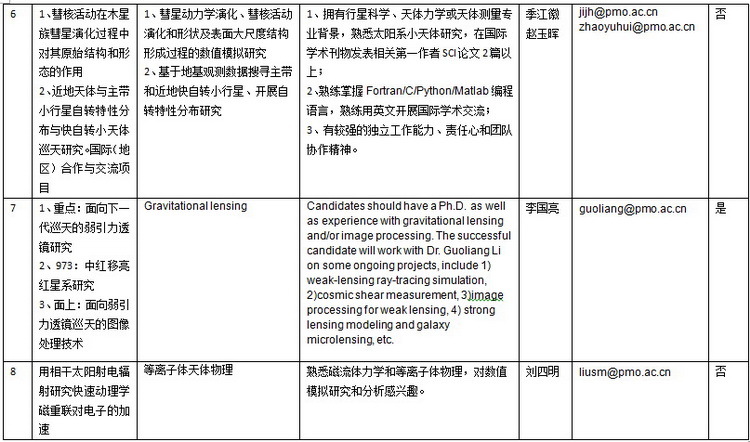 ⑤ Other documents that represent the ability and academic aptitude of the applicant. 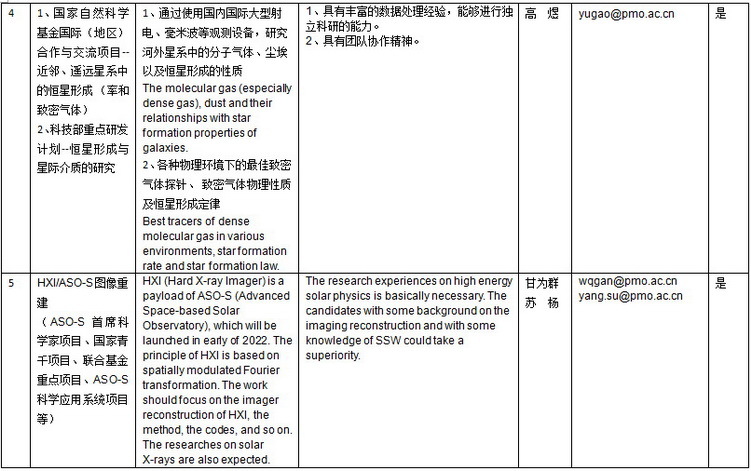 The above documents should be mailed to Ms. Lu Jin, Human Resources and Education Office, Room 402, Building 2, Purple Mountain Observatory, No. 8 Yuanhua Road, Qixia District, Nanjing, Jiangsu, China, and sent an electronic version to jinlu@pmo.ac.cn. B) Qualified applicants for application will be informed by phone or email. Accepted or not, the application materials will not be returned to the applicants. C) Recruitment will continue until all positions are filled.